What a fantastic day it was! 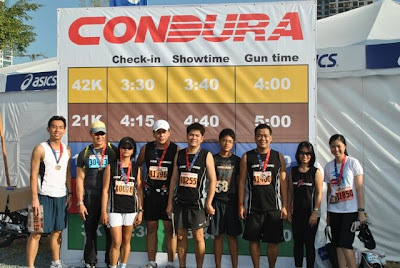 Condura Run 2010 was indeed a success. 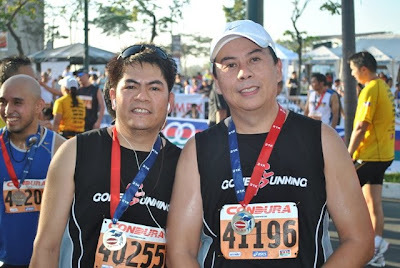 About 8,500 runners participated in this much awaited running event of the year. For some it was their first run, others did a mileage level up from their last year run, and many have set their new Personal Record (PR). The introduction of the full marathon in this year’s event made it more exciting. Though there were some new highlights in the race, there were still some problems that frustrated some of the runners. 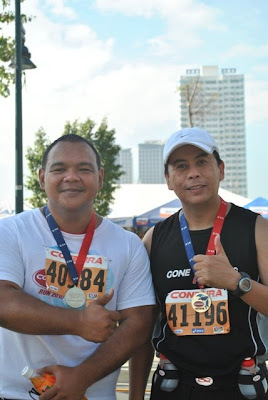 I have been preparing for this event hoping to get a new PR for my half marathon. I was hoping to run the 42km but since I just recovered from an injury, I did not risk it and instead trained for a 21km. It was full determination and excitement that pushed me to take on the challenge and focused on meeting my target time which was 2:15, I finished the race at 2:18:31 (official time). I was practically running at an average pace of 6 min/km in my first 10km which lead me to another PR hitting it in 61 minutes. 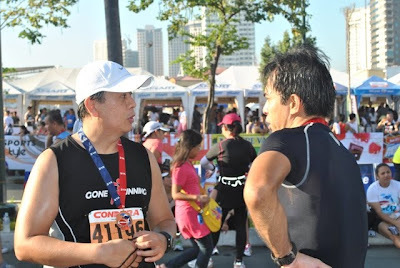 I was steady in my first 14km and started to slow down to recover at the 15th km. As I was approaching the Kalayaan flyover, I planned to walk, luckily Val (fellow GRC member) caught up with me and started to run with me. 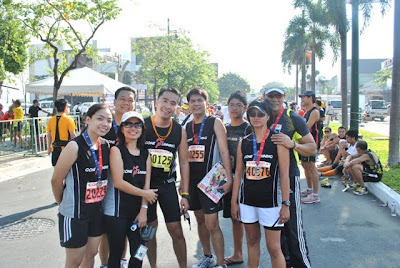 My legs were already fatigued but I was not ready to give up especially when I was close to achieving my goal. 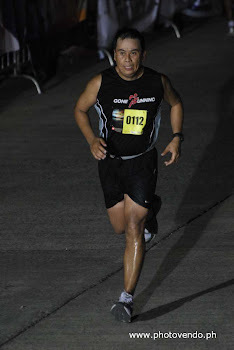 As I reached 21km in my garmin, I already hit 2:14, but it was 700m to go at finish line. It took me another 3-4 minutes to reach it. It was a good finish for me obviously as I hit two PR's in this event. Truly, preparation is key in achieving my goal. I was glad also that my injury had fully recovered. Will continue my training as I am yet to meet my target time that I set for this year. Here are some highlights/lowlights of the event. 2. Cheering squad and bands playing at designated area to cheer the runners. 4. Banana supply at Takbo.ph and Reinier aid station. 5. Portalets were situated in designated area as well. 1. Street lights were off at the Kalayaan Flyover. 2. 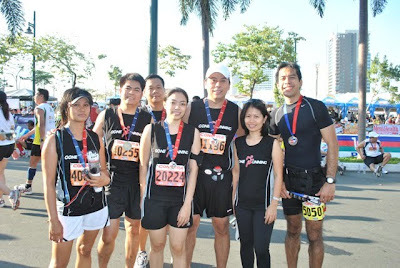 Medals were not available to some runners . Refer to Condura’s announcement here. 3. Long waiting time at the 10km finish since runners were queuing at the end of the strip. 4. Distance was excess of 700m (at least from my garmin). 5. Results were not accurate, some were timed later, while others were earlier. 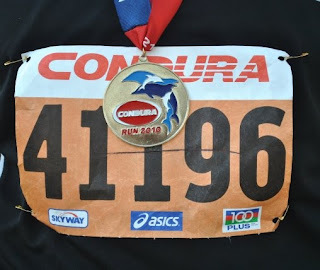 Hope a timing chip can be included in Condura 2011. 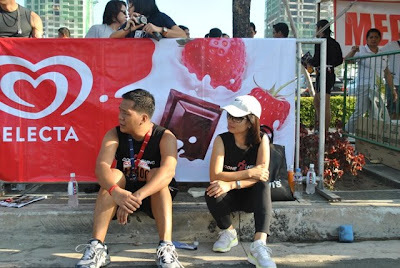 It was a successful event, hopefully next year's event will address some of the areas for improvements that were raised also by other bloggers/runners. Next year would definitely something to look forward to. Meanwhile, back to training for other events. With Val who gave me a push in the last 2km. Thanks man! With Junrox discussing his new full marathon PR (3:40!) 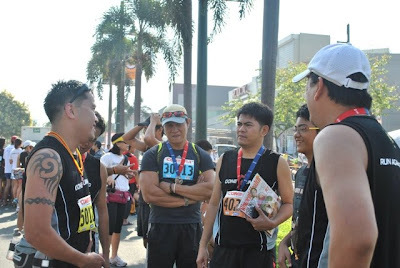 and giving some tips on how to improve my running. Ronald and Noemi, while waiting for the rest of the group. 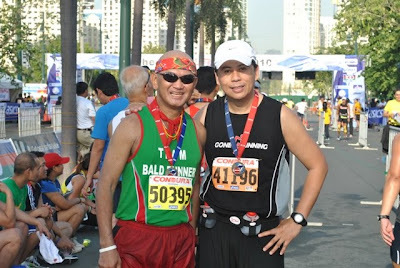 With Bald Runner, met him at the finish line. 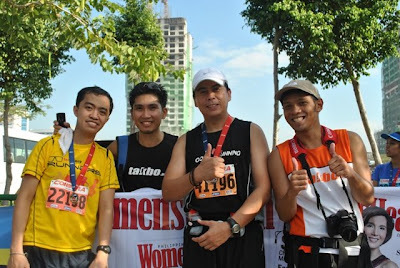 With Natz (I2runner) and his friends. You were fast natz! Great Run! 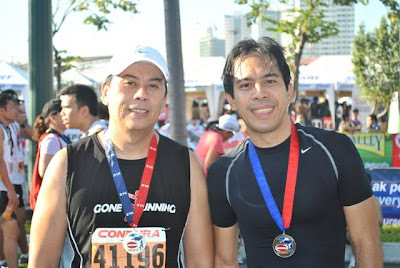 With Mike, finishing his first 21km. Congratulations! Welcoming Jay at the finish line. 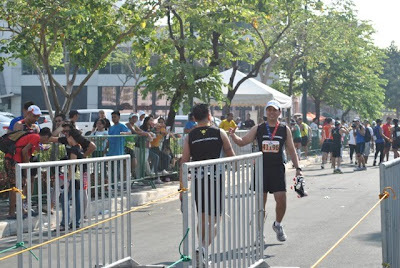 He was late by 23 minutes at starting line but still managed to finish strong. Jay discussing his skyway experience. congratulations again Mark !!! i totally agree with you when you said "preparation is key". looking forward on your next full marathon... sub-5? Thanks pre, yeah, sub-5 it is.. See you in the next run..